Chris Hedges is one of the foremost ‘public intellectuals’ in the USA. One of the clearest voices on the left and a harsh critic of US imperialism. Hedges takes a clear, uncompromising view of the reality that is confronting us. He advises us to abandon hope, as that leads to disappointment and desolation, and to focus on what we can practically achieve and through that process find deep personal meaning in our engagement. He references many key texts, and draws on his deep experience of 20 years as foreign corespondent for the New York Times before quitting his influential position as head of the middle east office over the NYT’s refusal to accurately convey the disaster that was the Iraq war. The interview is deeply revealing of how the state controls the narrative and also how journalism has been eroded to ‘court gossip’. Ex Wall Street bond trader, turned financial journalist presents a fresh perspective on economics and social change. This episode fits perfectly into the theme of climate emergency and collapse. Its a good watch and on topic, witty, acerbic, insightful and informed. Are we living in an era of soft totalitarianism? Will there be a Davos 2020? We need to cultivate a culture of deep reverence for nature and be prepared to accept the lessons of our own observations. I added this as a counter balance to the other two videos. However we see the times we are living though it seems to me it is this interaction between our economic world and the real ecology we are embedded in that we need to concentrate on fully as we are clearly getting this very wrong currently. The issue both of the first two videos addresses is the mechanism by which we can over throw the status quo. The over throw of Wall Street, of the Imperialism and the empowerment of all people to face our collective challenges together seems to be a common theme. What does declaring ‘Climate Emergency’ mean? The authority says the declaration “recognises the climate change crisis and the need for urgent action”. It follows a motion debated at a full Council meeting today, where the Council called on Westminster to provide the powers and resources necessary to achieve the target for Cornwall to become carbon neutral by 2030 and committed to work with other Councils with similar ambitions. The motion – ‘Urgency on Climate Change’ – was brought to Full Council by Councillor Dominic Fairman, local member for St Teath and St Breward, and seconded by Councillor Edwina Hannaford, the Council’s Cabinet portfolio holder for neighbourhoods. The motion was amended by Councillor for Falmouth Smithick, Jayne Kirkham, to declare a climate emergency in line with the declarations of other local authorities. Town by town and now whole counties are declaring a climate emergency, but what does that entail? Should we all be pushing for similar action locally? The science is settled, yet we seem unable to collectively plot a course to a safe horizon. Global emissions are still rising, they are still drilling and even worse we are still subsidizing the costs of bringing fossil energy to market and putting obstacles in the way of renewable energy development and investment. This must change. But we definitely know that continuing to work in the ways we have done until now is not just backfiring – it is holding the gun to our own heads. With this in mind, we can choose to explore how to evolve what we do, without any simple answers. The Prof. in a recent paper of staggering implications argues convincingly that we have to consider three courses of action, immediately as carrying on as we are is counter-productive to our own survival. 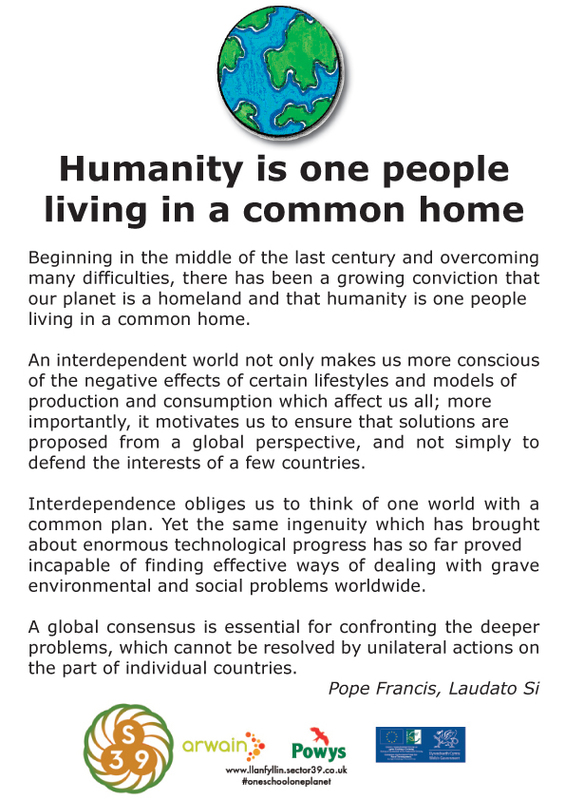 What are the valued norms and behaviours that human societies will wish to maintain as they seek to survive? This involves people and communities letting go of certain assets, behaviours and beliefs where retaining them could make matters worse. Examples include withdrawing from coastlines, shutting down vulnerable industrial facilities, or giving up expectations for certain types of consumption. This involves people and communities rediscovering attitudes and approaches to life and organisation that our hydrocarbon-fuelled civilisation eroded. Examples include re-wilding landscapes, so they provide more ecological benefits and require less management, changing diets back to match the seasons, rediscovering non-electronically powered forms of play, and increased community-level productivity and support. We will be meeting in the Cross Keys again next week, that is Thursday 31st January, Llanfyllin High Street. 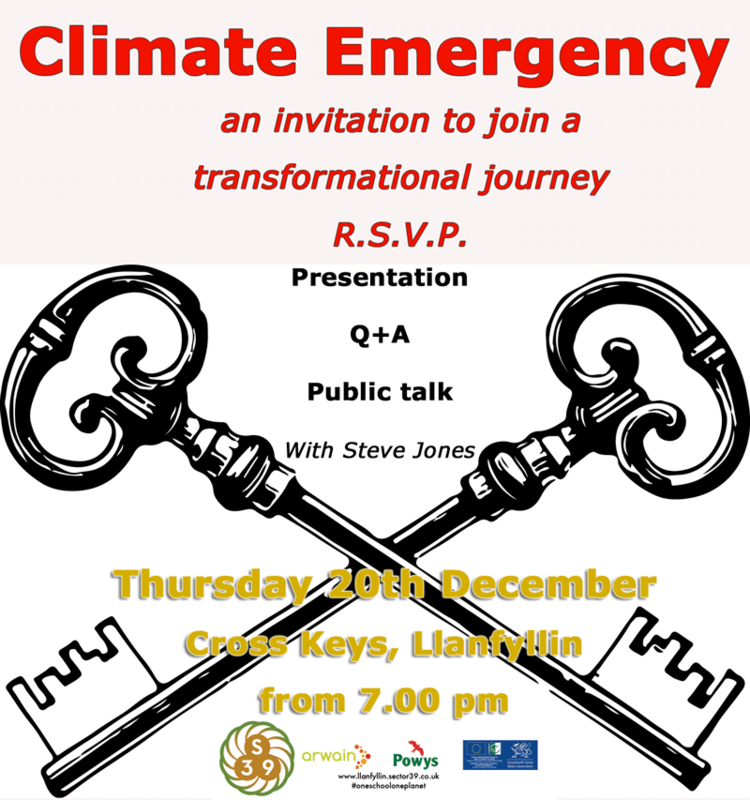 It is a free event, refreshments are served, donations to Cross Keys are welcome. Doors open 7.00 pm formal business from 7.30. In last weeks meeting we looked at issues around key topics. Will also be profoundly hit by transport costs. Ideas shared were can children educate their parents, it is after all there future that is being destroyed. The kind of jobs people are being prepared for will not exist, are we even creating the right skill set in pupils. Can we cope emotionally with the changes before us. Food growing, processing storing and cooking. Can permaculture be part of education, and children more empowered to shape the school environment and hierarchy? Un-schooling, can we bring people of different ages and backgrounds together to share life experiences and skills and find new ways of learning? Powys has miles of roads, a dispersed population and is very vulnerable to cliamte or market disruptions. We need to think a lot more about transport. Car we go car free through sharing schemes, car clubs and community taxis. Electric bikes, what other alternatives are there? Can we create a local currency, or several different types of ways to interact with local, esp. food economy. Social ecoomy work can be rewarded with local currency.